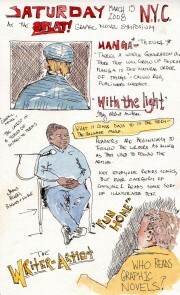 The one must-read report so far on this graphic novel symposium comes from Karen at Pen In Hand, who took notes in an entertaining, visual fashion. The writer Brian Wood posts about his own experience over the weekend. One of the best comics bloggers out there, the retailer Mike Sterling, made a rare convention appearance at Wizard World LA and writes about the experience here. Here's a slightly different perspective from someone that traveled with Sterling to the show. Here's Wizard's catch-all post on their show. And here's Newsarama's. The writer Matt Fraction has a series of obtuse photos up detailing his own LA experience like this one. Mark Verheiden gives his take on the show. I enjoyed this random-seeming video from the floor.